Whether you Believe it or not, Evolution Exists. Actually, Trading School Evolution. I never liked doing my homework or waking up early in the morning to go to school just to listen to a fat, bald teacher’s ramblings about splitting atoms or combining some substances that I’m never gonna use anyway; or the biology teacher explaining about petals and stems… I didn’t see the point of it all and I still don’t. In fact, I believe that education should be focused on things you are going to use in the future… but then again, how can you know from a young age if you are going to become a biologist or not. If you actually do become a biologist, all that talk about petals will probably pay off. 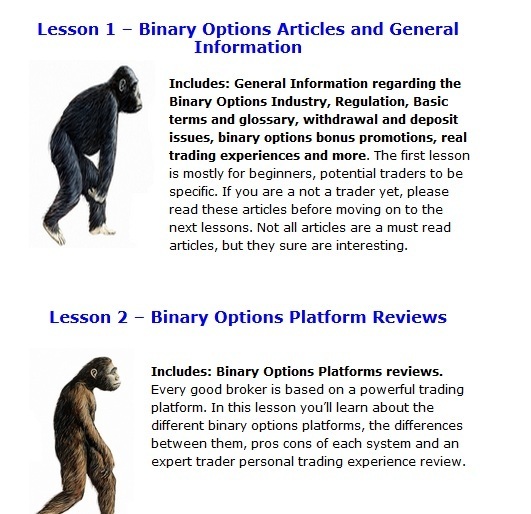 Anyway, if you are reading this, you probably decided that you want to trade Binary Options so education in that area should be of interest to you. You know, sometimes teachers learn alongside students. I mean, teachers are not born, they are made and not everything is perfect from the first attempt. Here, we invented the time machine to show you how our School looked a way back in 2012: click on the Time Machine. If it loads a bit slow, just be patient; bending the time-space continuum is pretty difficult, you know. You see, we tried, but we didn’t quite get it the first time. 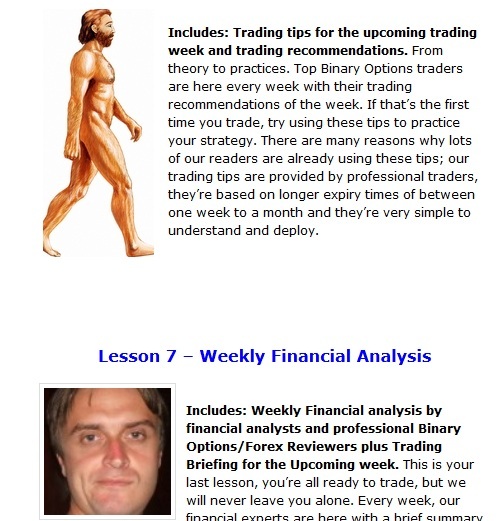 Sure, if I were to compare the educational value of our early content to the one offered by any binary options broker, the difference of quality would be huge; it would be like comparing Michael Jackson with a street performer or a Lambo with a Fiat…. Ok, ok I’m exaggerating because I am being subjective. Anyway, it was good compared to brokers’ material, but still not good enough according to our standards. It was too thin and not structured well enough. So we did the only possible thing we could do: we improved. Making it Fun – Cause Learning is Fun! First step was to add a lot more content and then structure it on different levels of education. After all, we wouldn’t want our school to begin with overly complicated stuff that will chase “students” away. So for the first time we layered the content under three categories: Pre School, Primary School and College. We also introduced a way for you to track your progress – yes, pretty little blue dots mark a completed course. And maybe the best addition was the Quizzes section: each lesson/article has a quiz which actually lets you know if you learnt something or if you are left with more questions than answers after reading the lesson. Oh yea, we got rid of the monkey pictures as well… Check the Time Machine if you don’t believe me. 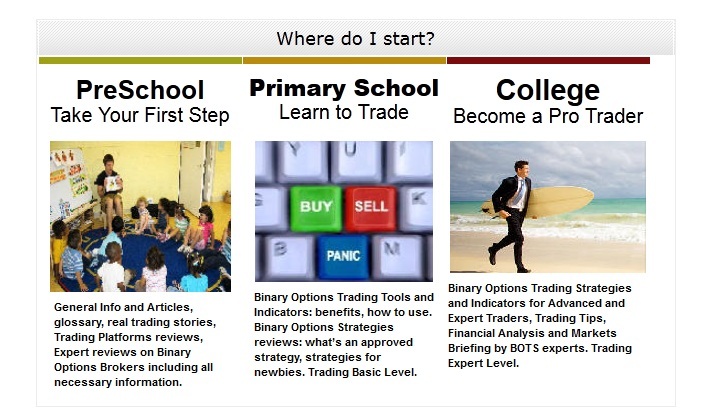 In our current version of the binary options trading School, we fixed some minor glitches, we polished the graphics and of course, added a little extra content. No major changes were made but I can’t say this is our final version; we’ll keep adding strategies, tools and everything we feel will make you a better trader. As a cherry on top, we brought you the CommuniTraders platform where you can really test your skills as a trader, with no risk for your money because we give you 20K of virtual money. It’s true that you won’t be able to buy a car with the winnings made on CommuniTraders, but demo trading is a necessary step that prepares you for real money trading. There’s always room for improvement so the CommuniTraders 2.0 will soon be out, giving you additional features, options and better functionality overall. When we thought about creating a School section, we didn’t know exactly what is the best way to proceed, we didn’t have enough educational material, but our goal was to give you real, usable, money-making information so in a way you, our readers were and still are our number one motivation to keep learning and improving so that we can give you quality material and advice. I’d like to Thank You for that, because you are the reason why we evolved from our monkey-style School to what we have today. Cheers!